Comparing eyeshadow palettes is always exciting for me, but when two palettes are this close then it is all the more interesting. 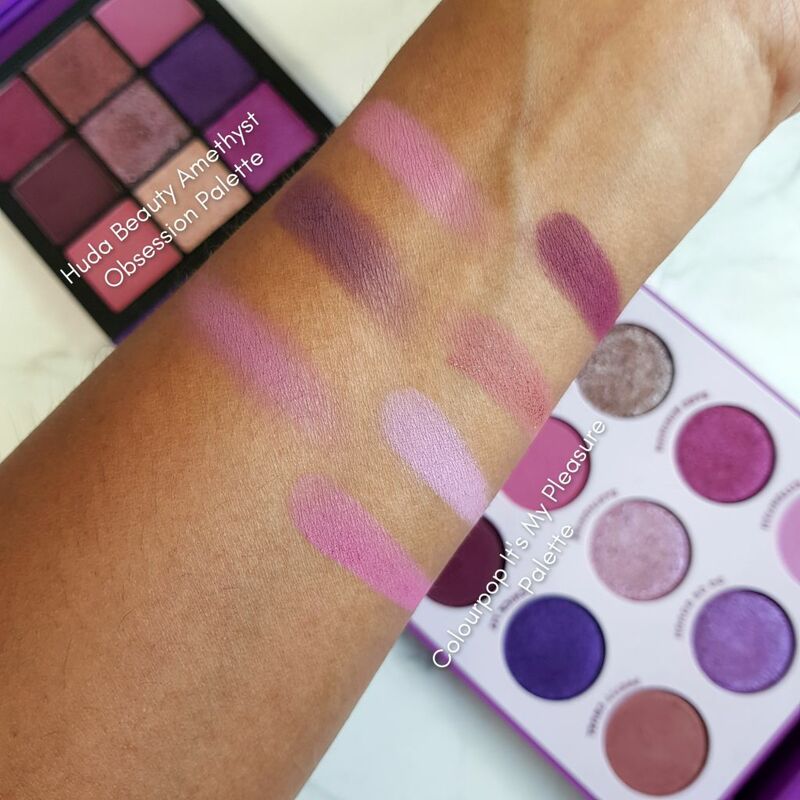 In this post, we are going to figure out how close are the Colourpop It’s My Pleasure palette and the Huda Beauty Amethyst Obsession palette. Both these palettes have my favourite colour story – Purple. One is pretty affordable and the other a more mid range palette. 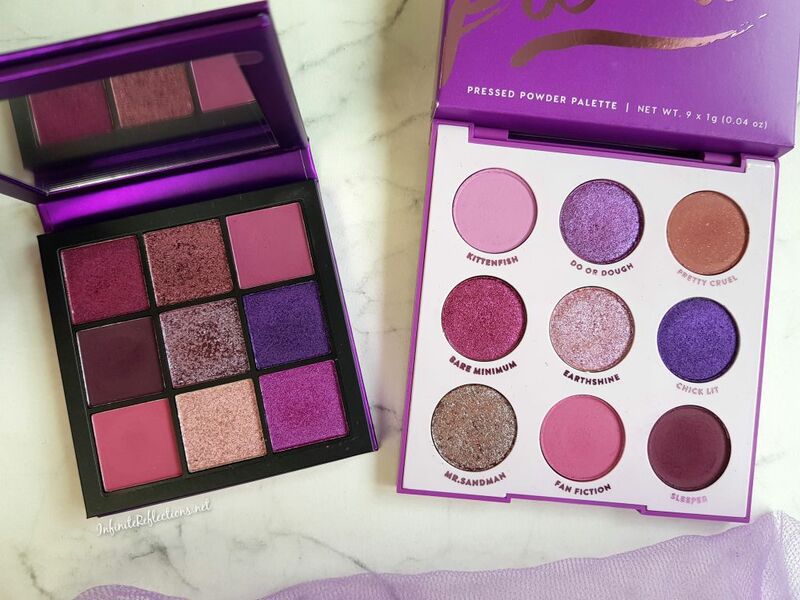 Both of them are 9 pan palettes with very similar colour story which would make many wonder if the Colourpop one is an intentional dupe to the Huda Beauty one. Since, Colourpop has been doing the 9 pan palettes for a while in different themes, maybe a purple palette was in offing too but we would never know that. 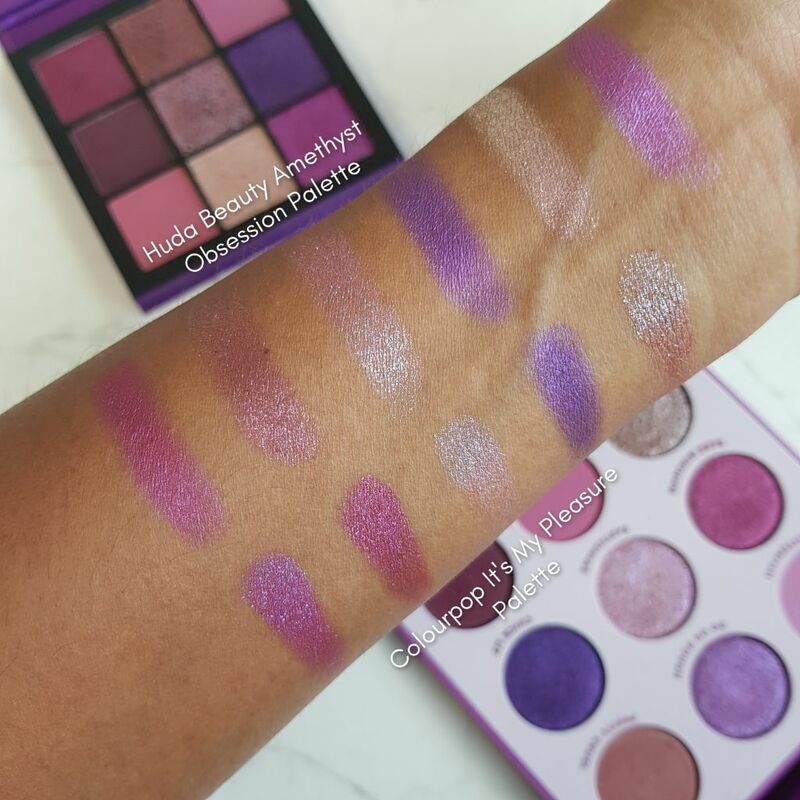 Let’s take a quick look at the Huda Beauty Amethyst Obsession Palette first. This palette was released last year and I had purchased this almost immediately. It certainly did not disappoint. The colour story and quality of the palette is amazing. The best part of these obsession palettes are definitely their size and compactness, but still not compromising on the quantity. 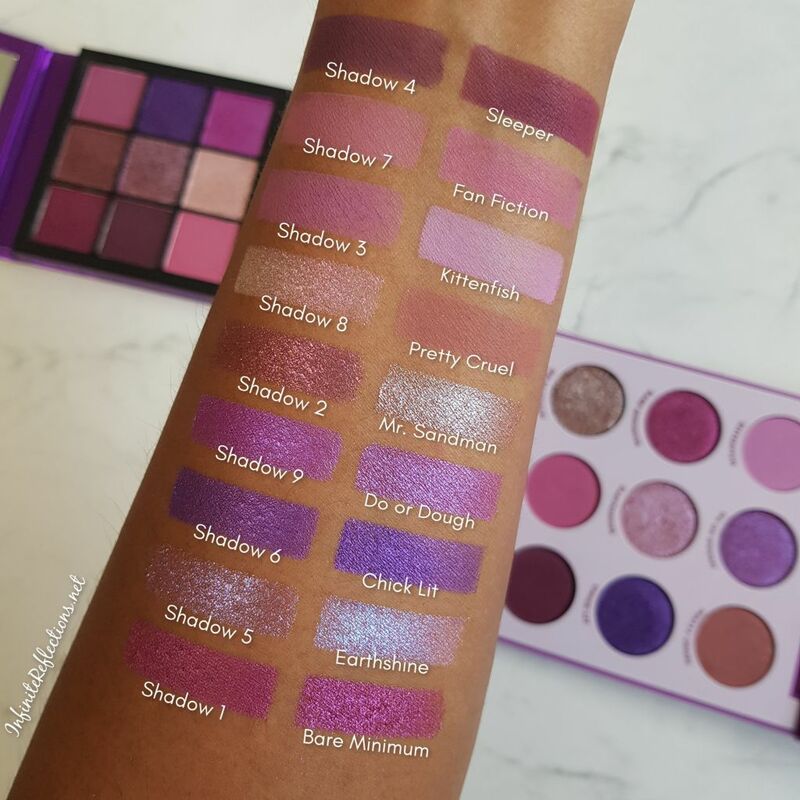 The Amethyst Obsession palette has 9 shadows with each pan containing 1.1 gm/0.04 oz. o product. This palette retails for USD $27. The matte shades are really creamy to touch and they blend very well. Compared to the Colourpop palette, the fallout is not much with this palette. The metallic and the duo-chrome shades are more firmly pressed in this palette and work best with the fingers. But, they do provide a nice intensity and they look smooth on the eyes. The duo-chrome shades provide a pretty shimmer and sparkle to the eyes. 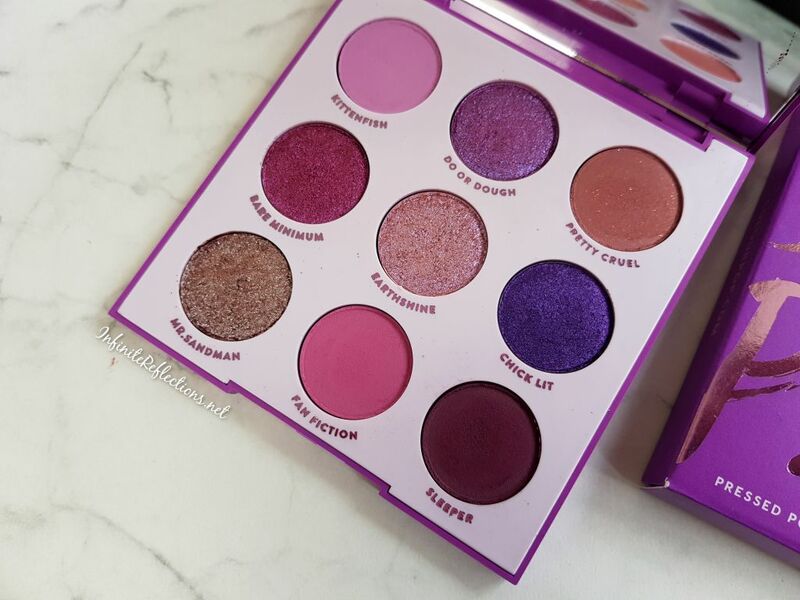 Now, here’s look at the new Colourpop It’s My Pleasure Palette. 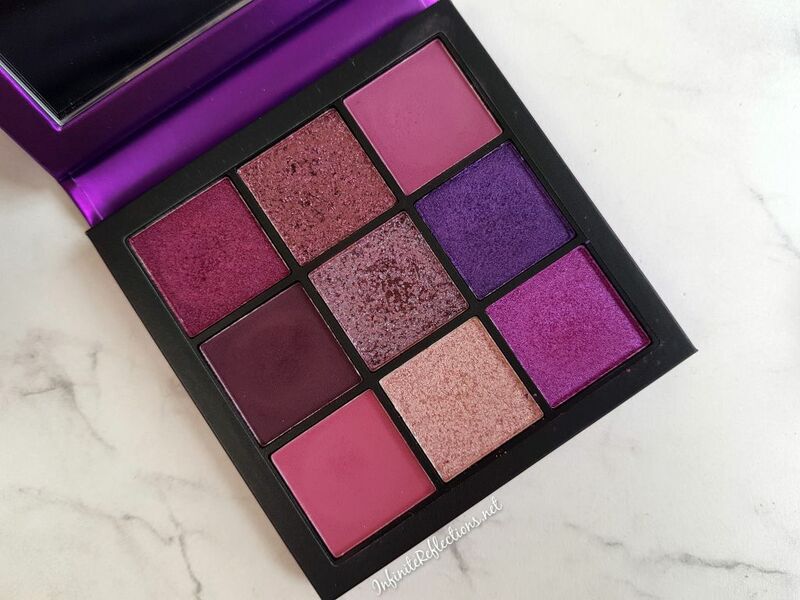 The colour story of this palette is very similar to the Amethyst Obsession palette. 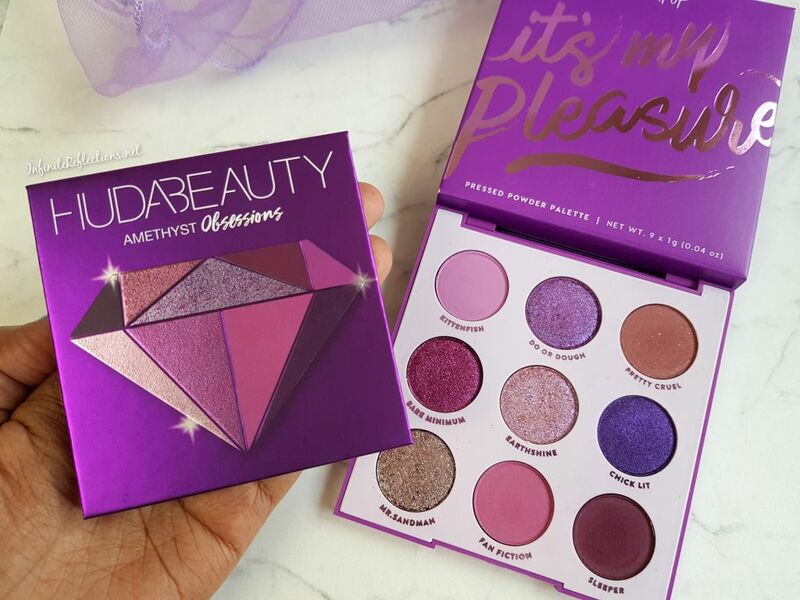 This palette has a plastic packaging unlike the cardboard packaging of the Amethyst Obsession Palette. 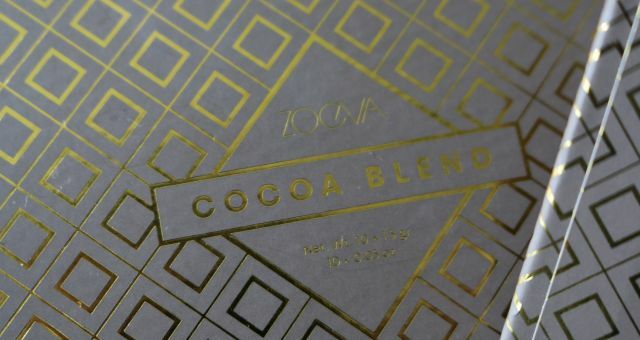 It also has 9 eyeshadows and each pan contains 1 gm/0.o4 oz. 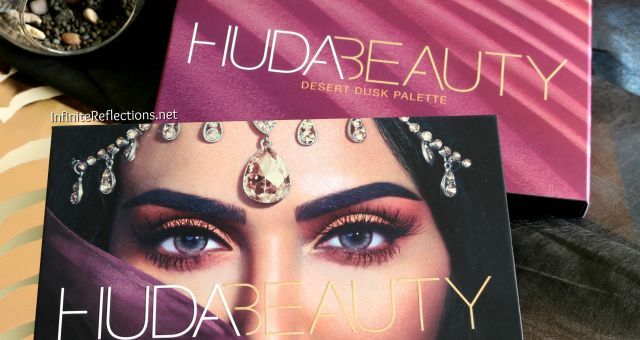 of product, which is very similar to the Huda Beauty palette. A nice touch in the Colourpop palette is that all the shadows have names, a feature I always appreciate. But, the best part is that this palette retails for USD $12, which is so affordable. Now, for the quality of the shadows in this palette. The mattes are really nicely pigmented. They do not feel very creamy but work great of the eyes. But, there is quite a bit of fallout with one or two matte shades, so we do have to be careful with this palette. The metallic and the duo-chrome shades are just amazing. They are superbly pigmented, smooth, intense and are not as firmly pressed in the pan, so they are easy to work with even with a brush. 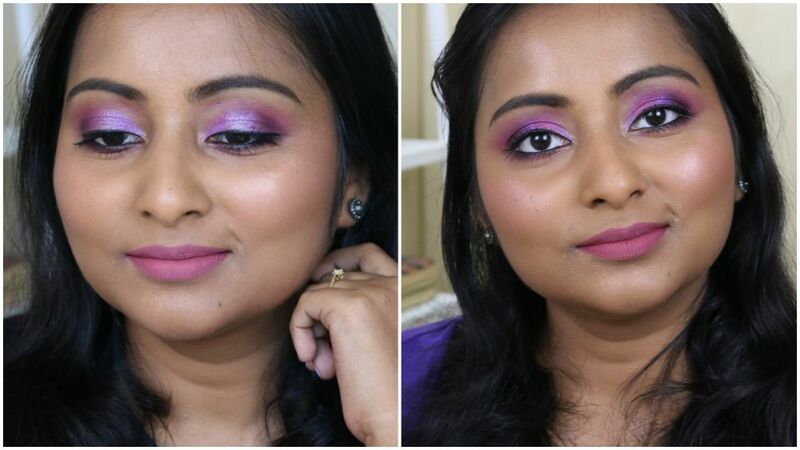 The duo-chrome shades give a beautiful glittery and sparkly finish on the eyes. Overall, both the palettes are amazing and I will highly recommend both of them. However, you can get very similar looks with both the palettes, so it might be economically more viable to choose the Colourpop one. But, there are few shades which are different between the palettes, which I am showing here next. From the swatches, it is clear that there are many similarities between the two palettes. Even if the shades aren’t exact match, many of the shades are very similar to each other. In the Huda Beauty palette, there are 3 matte shades and in the Colourpop palette there are 4 matte shades. All the matte shades seem very similar to each other barring the one extra matte shade which is there in the Colourpop palette. As for the metallic and duo-chrome shades, there are more metallic shades in the Amethyst palette, so we get a bit more variety. But, two of the metallic shades and two of the duo-chrome shades are very similar to each other. So, between both the palettes there are at least 6 shades which are very close to each other. I always prefer regular swatches, so here are the regular swatches of both the palette. First, a comparison of the matte shadows. Here is a comparison swatch of the metallic and duo-chrome shades. So, what do you think about the comparison? I am really interested to know which palette you will choose. I love purples and I am impractical sometimes so I have ended up buying both of them. But realistically, I don’t think you need both. So, which one will it be? Let me know in the comments below. That’s all for this post everyone. Hope this was helpful. Interesting comparison! 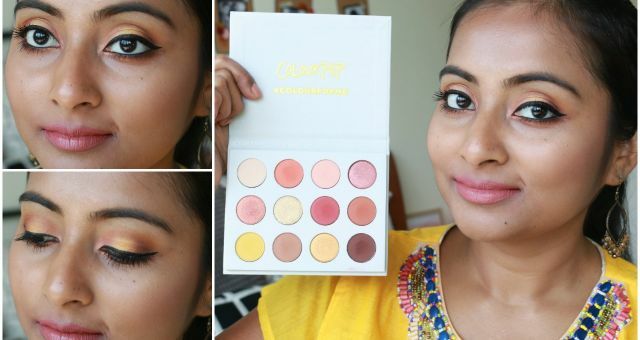 I would definitely pick the ColourPop palette over the Huda, just because of the price!